Before the Cathedral of Angers at the end of the procession in honor of the Immaculate Conception (see chronicle). Moreover, the Archbishop explained that, in order to be the doctor of souls, one must know about the diseases of the soul. We know of what spiritual health consists: the principles of the Faith. 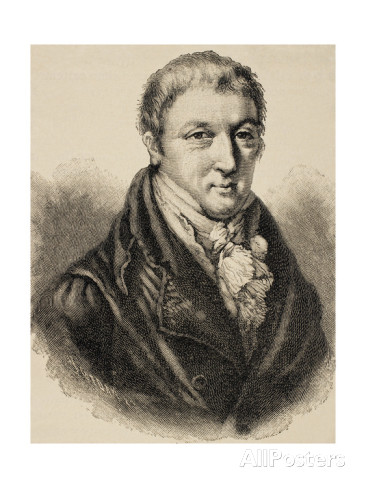 However, we must also understand the current errors which are opposed to these principles, and especially the error of liberalism which is at the root of all modern errors. We must have the weapons to defend and protect the souls entrusted to our care. Such has always been the conduct of the Church. For example, in the first years of Catholicism, the Church has had to fight against the errors of the Judaizers and the Gnostics, and, later on, against the Cathars, the Protestants, the Jansenists, the “Enlightenment” philosophers, the secularists, and so on. 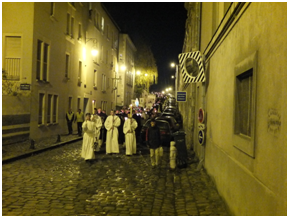 Procession through the streets of Angers in honor of the Immaculate Conception. 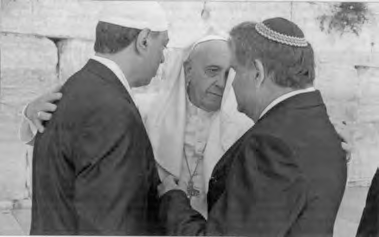 For example, the Popes, from the 18th to the 20th century, have promulgated 15 documents that condemn Freemasonry, which is just one aspect of liberalism. The encyclical Humanum Genus (April 20, 1884) of Pope Leo XIII is the most well-known of these anti-Freemasonic documents. Doesn’t this example illustrate the importance the Church gives to pursuing and condemning errors? To study such errors is to understand the causes that are currently destroying society, and which are also destroying souls and the Church… If we remain ignorant of error, we will be incapable of understanding the current situation in the world – and in the Church – which are so disastrous. If we choose to remain ignorant of error, we will be powerless to understand the diffusion of the evil that is spreading everywhere now, even in the Church itself. Thus, not only shall we be powerless to stop evil from growing: we ourselves will fall prey to evil. Hence, “it is an absolute necessity to study liberalism, and to know it well,” concludes the Archbishop. May our Infant King give us the grace during this New Year to study more profoundly both truth and error in order to fight ever more faithfully to spread His reign. 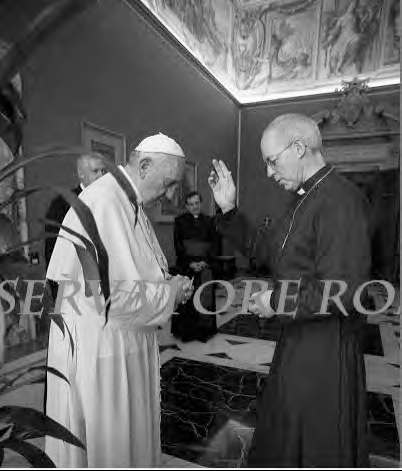 For fifty years the Conciliar Church hierarchy remains obstinate in this false ecumenism that leads to death. It would be time to learn one’s lessons. It is known that Tertullian said that the blood of martyrs is the seed of Christians. 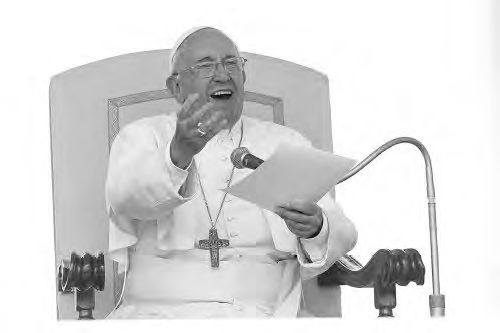 As for the Pope, after the September 7 assassination of three religious Sisters in Burundi, he hopes that “the blood shed become seed of hope in order to build a true fraternity among nations”. 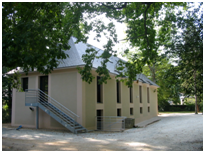 The All Saints’ Day break for the school allowed us to finish up the new dormitory “Naïm”. The study hall on the second floor was able to be painted and the floor installed. Thanks to your generosity, the boys now have a true dormitory up and running. However, the projects continue (for example, a new sewer system for the school), and we still have some last bills to pay. Be assured of our grateful prayers for all your help in whatever way it may be. 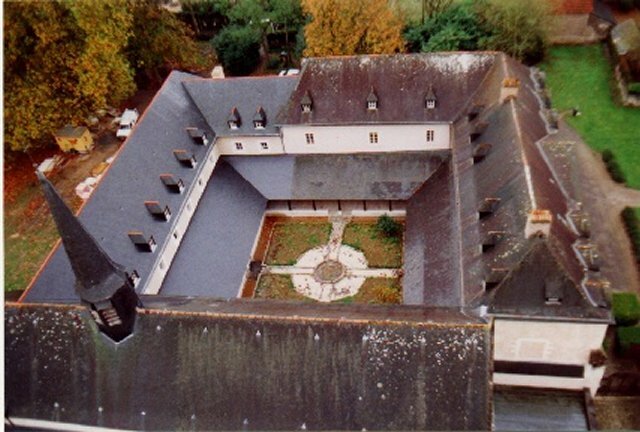 August 14-18: Three days of formation and Catholic friendship for our tertiairies here at our friary. September 20-21: Father Marie Dominique and Father Angelico preach for the pilgrimage to Our Lady of Laus in the French Alps. October 4: Second reunion of the Society of Jesus Crowned with Thorns (for the practice of perfect Christian ladylike modesty) under the direction of Father Prior and Father Hyacinth Marie. 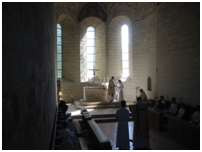 October 11-12: Several meetings for our tertiaries throughout France. 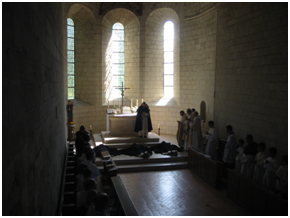 October 18: Conference for the high school boys and the faithful by Father Pagès on the dangers of Islam. 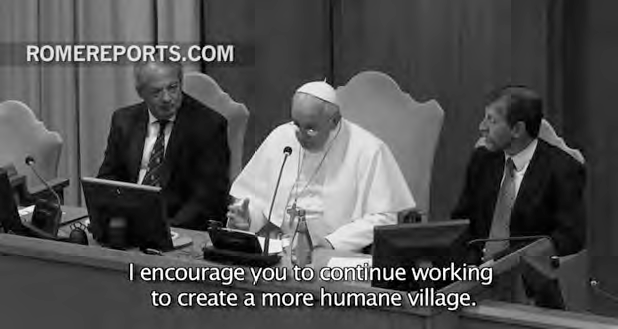 Although Father Pagès is not “traditionalist”, but he bravely says the truth about Islam. October 24: Father Marie Dominique and Father Terence begin a mission to the US and to Canada under the protection of Saint Raphael. They have the joy to meet everywhere faithful thirsting for doctrine. Unable to visit them often, we are opening a website (www.dominicansavrille.us) in English so that we can give them articles and documents of our publications. 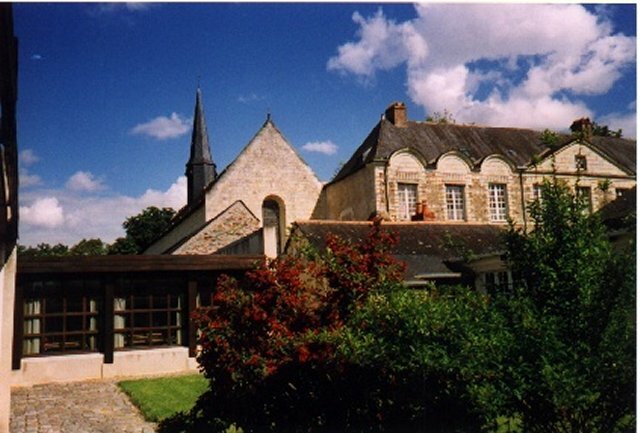 October 31: Most of the community goes on pilgrimage to Pellevoisin where Our Lady appeared about fifteen times to a Dominican tertiary named Estelle Faguette in 1875 and 1876. 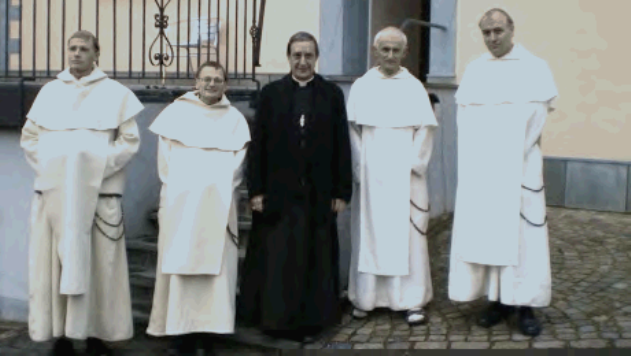 November 15: Father Marie Dominique and Father Marie Laurent give a public conference in Paris. The theme is “How to see clearly through the current situation of Tradition” and the goal is to analyze peacefully and objectively official documents without judging persons. December 8: A candlelight procession in honor of the Immaculate Conception follows a solemn High Mass. 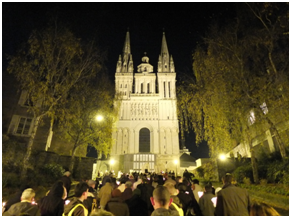 We give this public homage to our Blessed Mother through the streets of Angers and in front of the Cathedral. December 22-January 6: Final preparations and solemn offices to honor, once again, Our Lord and Savior’s birth and the mysteries of His Nativity. Please see our Contact and Subscription page. These letters are published every three months. They contain information on topics of concern, news of our community, upcoming events, and contact information. If you wish, you can signup to be notified of these letters as they are published.